On Tuff Hedeman’s advice, Boudreaux Campbell doubled down and selected an unknown bull for the Shoot Out round, and for the duration of the next eight seconds, he captivated the sold-out South Point Arena crowd fighting every step for his 91 points aboard 53 Wired Up. The South Point Tuff Hedeman Bull Riding Championship was the Crockett, Texas cowboy’s first win on the 4-time World Champion's invitation-only tour. Campbell, a two-time NFR qualifier and 2017 PRCA Rookie of the Year hit the jackpot worth $26,000 which included a $2,000 bonus from Rock and Roll Denim for earning the win in their jeans. 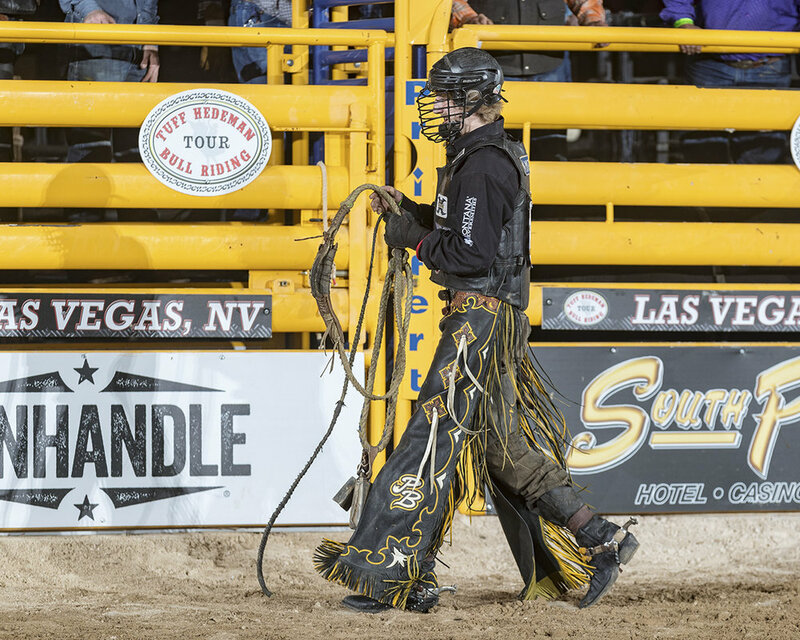 Winning in what was dubbed as the Las Vegas Ultimate Sports Weekend, Campbell earned his first custom engraved Tuff Hedeman Bull Riding trophy buckle riding two with an average of 178 points. 21-year-old Campbell, in pursuit of his third National Finals appearance in Las Vegas, is a two time Texas High School Bull Riding Champion who has earned over a quarter of a million dollars riding bulls professionally in the PRCA and an additional $200,000 in bull riding only competitions. Campbell turned professional in August of 2016. "It's great and fun here, and the crowd was awesome, but you have just to ride your bulls everywhere you go, it's the same job each time, ride one bull at a time," said Campbell following the win. It was “bulls night out” for the buckers as they made a statement early bucking off eight consecutive riders and only allowing seven qualified rides in the first round of 24 elite professional riders. NFR qualifier Jordan Spears, one of only two passengers to cover two, won the series with 87.5 aboard 49 B Top Line of Whisnant and Shaw Cattle Company. Fort Worth Champion Foster McCraw heard the whistle but was called for a slap aboard 55 Moneymaker (Mason/Smith Bucking Bulls). Campbell, a left-hander, was the first to post a score as he rode D52 Slammu Jammu (Danley) into his hand for a solid 87 points. Rookie Wyatt Hart (Speckled Chicken) and blue-chip rider Trey Benton (Fat Boy) had disappointing 7.32 and 7.94 finishes, but both would draw back on time to the semi-final round. Laramie Craigen, Dalton Kasel and Josh Frost would all turn in 86.5 rides, and Trey Kimzey clocked in at 84.5 points aboard 291 Rocky Mountain Hi (Whisnant/Shaw), and Laramie Mosely posted 83 points. With only seven bull riders posting a score, five would advance on time ridden including the current No. 1 ranked cowboy in the PRCA, Clayton Sellers, NFR qualifiers Trey Benton, Cole Melancon, and rookie rider, Colton Fritzlan. Twelve outs and two survived as the bachelor party in the pens continued. A pair of 87's highlighted the second round turned in by Clayton Sellars on Break the Chain (JQH) and Jordan Spears on 48B Top Line. (Whisnant/Shaw). Campbell bucked off in 4.4 and had this to say about his second draw. No. 1 ranked PRCA cowboy Clayton Sellars taps Break The Chain (JQH) for 87 points. and the Semifinal round win. “I got on Yo-Yo of Mike Rawson’s in the semi-final round, and I had seen him before, started riding him perfectly and then made a little mental mistake and bucked myself off,” said Campbell of his semi-final draw. Spears, with two down, was now leading the average earning him first pick of Hedeman’s hand-picked final four Shoot Out round opponents. Spears asked for 36B Stage Fright (Barker). Campbell took 53, Craigen and Sellars took Bumble B and Legacy (Whisnant/Shaw) respectively. Craigen and Sellars both bucked off. Campbell on advice from Hedeman selected a bull he had not seen. As the third rider out, Wired Up left the chute in his left hand hard and fast and Campbell had to hustle to keep up. He got out from under him more than once, but Campbell waged his best effort to complete the ride and was rewarded with a 91 point score from the judges and a rousing appreciation from the crowd. In the end, Campbell, who was not watching as his good friend and NFR qualifier Jordan Spears was the only rider to make the whistle to take home to Texas the bulk of the sudden death prize money. “If he had ridden I would have been happy for him too, that’s how it is on the road,” said Campbell. Military appreciation always a highlight during intermission on the THBRT. Steve Stallworth of the South Point and Tuff Hedeman present Bob and Julie Whisnant and Hayden Shaw Cattle Co. with the Las Vegas Bull Team Championship. Bull Team Challenge Champions in Las Vegas were Bob Whisnant & Shaw Cattle Company who brought nine bulls to Las Vegas. Their bull 12B Hellfire made his way around town as the mascot of the South Point Tuff Hedeman Bull Riding and represented the event at the week's Ultimate Sports Weekend activities which included a three-hour television shoot and Fan Fest in Downtown Las Vegas. “We are above and beyond pleased with everything's performance, not only did Hellfire have a good week with Tuff and the gang he also matched up with NFR Bull Rider Jordan Spears to start off the show with a bang and had the High Mark Ride of the Long Round. “Overall I am very pleased with the bulls performances & have to give a big thanks to the best partner in the World Bob Whisnant and my hauling partner one of the greatest bull men in the world Laramie Wilson for covering for me this weekend and bringing home the Las Vegas Bull Team Championship high marked bull back to Douglass, Texas. JQH finished second in the competition of the bull teams and Skip Jones had this to say after watching his bulls. "That's the first time that bull has been ridden since we bought him and I was happy to see him keep bucking all the way through so well. I want to thank Tuff for keeping the bull team concept and for having such great events,” Skip Jones. 1, Boudreaux Campbell, Crockett, Texas, 91 points on 53 Wired Up, Barker Bucking Bulls, $24,000. 2, Laramie Craigen, No Score, 157 Legacy, Whisnant/Shaw Cattle Co., 3, Clayton Sellers, Fruitland Park, FL, NS on 67B Bumble B, Whisnant/Shaw. 4, Jordan Spears, Redding, CA, NS, 36B Stage Fright, Windy Valley Buckers. 1, B. Campbell, 178 on 3, $26,000. Jordan Spears, 174.5, $2,250. Clayton Sellers, Fruitland Park, FL, 87 pts, $1,750. Laramie Craigen, $1,500, Winnie, Texas, 86.5. 1, Whisnant/Shaw Cattle Co., Texas, 284.28, $24,000. 2, JQH Bucking Bulls, Amarillo, Texas, 282, $18,000. 3, Rafter B/Harris, Palestine, Texas, 281.44, $12,000. 4, Danley/TDS Bucking Bulls, 277.64. *Included in Campbell’s total monies earned was the $2,000 bonus for wearing Rock and Roll Denim jeans. Tuff Hedeman will will be at signing autographs at the LV Speedway - South Point Booth, Friday March 1 3 pm to 5 pm as he is all in at NASCAR’s XFINITY race with Jeremy Clements Racing. LAS VEGAS - Tuff Hedeman is ALL IN today at the Las Vegas Motor Speedway where his bull riding tour logo is now part of the Jeremy Clements Race Team RepairableVehicles.com car 51. Tuff and the cowboys will be signing autographs at the Las Vegas Speedway from 3 pm to 5 pm just outside the main gates at the South Point Hotel and Casino luxurious booth and hanging out in the Neon garage with Jeremy Clements Race team. Stop by and chat and take selfies with Tuff and the guys. SPARTANBURG, SC - Jeremy Clements Ragets back familiar black and red #51 Camaro SS RepairableVehicles.com livery as they head out West for the first leg of the #NASCARGoesWest swing at Las Vegas Motorspeedway Saturday afternoon. Tuff will also be at Boot Barn from 10 am to 12 noon on Saturday, March 2 on Las Vegas Blvd. Bring your hats, boots, and cameras and taking selfies with the 4-Time World Champion and Pro Rodeo Hall of Famer. Tuff’s logo will make its first Boyd Gaming 300 at the Las Vegas Motor Speedway on Saturday, March 2. 2-Time NFR qualifier and 2017 PRCA Resistol Rookie of the Year set to compete at the South Point on Saturday night. LAS VEGAS, NV – Bull Riders from 10 States including World Champions and nine National Finals Rodeo qualifiers return to the South Point arena as they hope to tap into their success and experience as an advantage while competing for the $30,000 purse at the South Point Tuff Hedeman Bull Riding held Saturday night March 2 at the South Point Arena. The Pro Rodeo Hall of Famer has lined up a competitive roster including World Champions and Wrangler National Finals Rodeo (NFR) athletes. Their opponents - Hedeman’s picks from the young superstars including JT Moore, Trey Holston, Trey Kimzey, Foster McCraw, and Ricker Carter to name a few. Great vendors and merchandise at the South Point - Doors open at 6:30 pm. On the line the custom trophy buckle and the championship title on the fourth stop of his 2019 national tour, the South Point Tuff Hedeman Bull Riding. “Last year’s champion Ruger Piva, NFR qualifiers Trey Benton, Boudreaux Campbell, Eli Vastbinder, Cole Melancon, Tyler Bingham, Jordan Spears are all premier athletes you won’t want to miss the opportunity to see them ride - if you didn’t make it to the NFR in Vegas where the ticket prices were high, you will see several world champions and at least 9 NFR guys right here at the South Point,” said Hedeman. The pioneer behind the sport of professional bull riding, 4-Time World Champion and Pro Rodeo Hall of Famer Tuff Hedeman, brings backs his two hour signature three-round tournament style event to the South Point showcasing the industry’s top 24 ranked bull riders for a one night only performance which tests their skills against the highly-skilled animal athletes. “This is family fun entertainment, and no bull riding experience or knowledge is necessary to enjoy this high energy adrenaline rush show, said Hedeman. JJ Harrison will entertain you in between sections of action packed bull riding. With 30 years of bull riding history on his resume, Hedeman is one of the most recognizable cowboys in the history of rodeo and bull riding, but he defers to the young superstars as the best bull riding talent he has seen in recent years. You and your family will enjoy top-shelf entertainment including the funny man JJ Harrison, the Tuff Hedeman Bullfighters, grand pyrotechnics introductions, and great family fun entertainment from leading entertainers in a jammed packed two-hour adrenaline rush show. Doors will open at 6:30 p.m. for ticket holders to enjoy the pre-event activities on the concourse including great food, cold beer, boutique, jewelry, and western shopping and bring your phone because we have autograph opportunities. Event begins at 7:30 pm. Meet Tuff Hedeman and Bryce Redo at the South Point Booth at the Las Vegas Motor Speedway - 3 to 5 pm on Friday March 1. 3 - 6 pm Fan Fest Tuff Hedeman Meet and Greet – Hedeman, the bull Hellfire, and bullfighter Bryce Redo at the Ultimate Sports Weekend Fan Fest, Las Vegas Events Center – South Point Booth. 3- 5 pm Tuff Hedeman Meet and Greet with Bryce Redo at Las Vegas Motor Speedway, South Point Booth 7000 N Las Vegas Blvd, Las Vegas, NV 89115. Tickets available at Ticketmaster link. Ticket prices begin at $30.00. VIP seats and tables available. For more information, interviews and media credentials, please contact Leigh Ann Schroeder, 940.902.1112 or tuffhedemanpr@gmail.com. 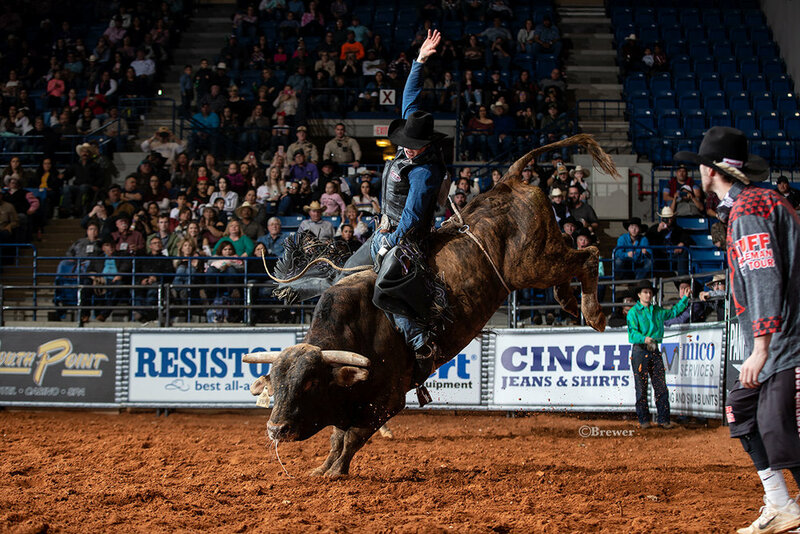 THBRT Hobbs Champion and Fort Worth Stock Show and Rodeo’s 2nd place bull rider JT Moore of Alvin, Texas has qualified for the final four-man Shoot Out round in two 2019 THBRT events and is scheduled to comepete in Fort Worth at the the South Point Tuff Hedeman Challenge presented by Rock&Roll Denim. 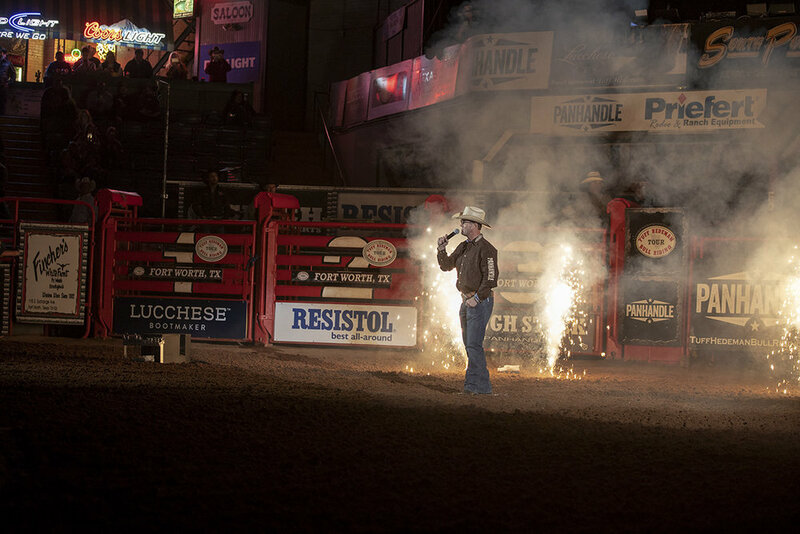 FORT WORTH, Texas (February 25, 2019) – Returning to the site where it all began, the pioneer of the sport of bull riding, Tuff Hedeman announced today that tickets are on sale for his annual Fort Worth Tuff Hedeman Bull Riding Challenge presented by Rock and Roll Denim. The four-time World Champion and Pro Rodeo Hall of Famer is preparing to celebrate twenty-seven years of the first stand-alone bull riding he produced for the first time in 1993 in Fort Worth’s Cowtown Coliseum. 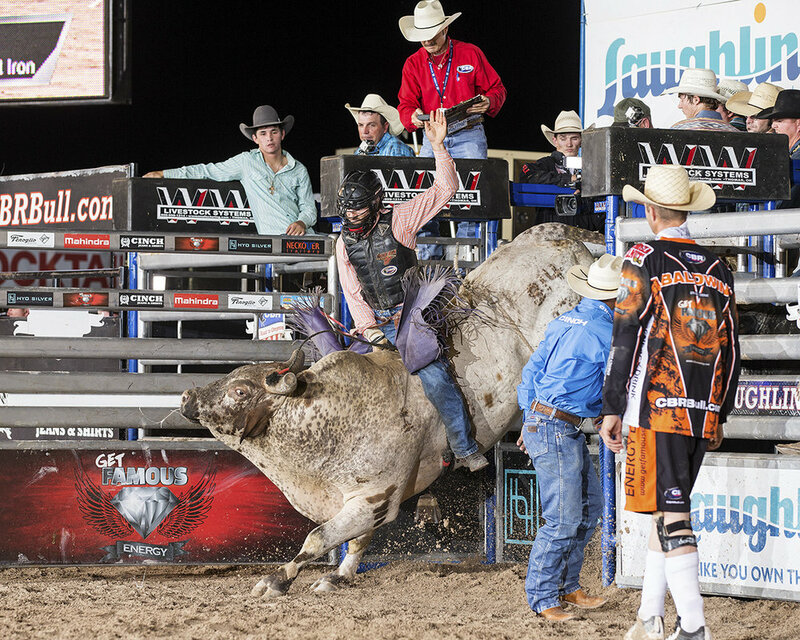 This classic bull riding competition is widely acknowledged as one of the corner stones for “bull riding only” events in the United States. The bull riding leader has been producing bull riding events that have been thrilling audiences with his two hour adrenaline rush entertainment style punctuated with the two things he knows fans want to see great rides and high scores. Hedeman’s signature “invitation only” three round sudden death tournament style event highlights a roster of World Champions and National Finals Rodeo contenders (NFR) where the cowboy athletes battle for the lion’s share of $30,000 in prize money. The format appeals to new spectators and established fans alike because riders can challenge as many as three bulls in one performance. Competing on the on the same dirt floor in the same arena where Hedeman produced his first event, he will once again pack the house and entertain bull riding fans and newcomers in town who are looking forward to experiencing a traditional western entertainment event featuring the industry’s elite riders against world class bucking bulls. 3-Time NFR qualifier and THBRT Bossier Champion Roscoe Jarboe finished second in El Paso andwill be invited to compete in Fort Worth at the South Point Tuff Hedeman Bull Riding Challenge presented by Rock&Roll Denim. Hedeman’s invitation only THBRT Bull Team competition will highlight the first two rounds of competition where super star buckers including World Champion and NFR bulls will compete in teams of three. Hedeman announced the return of Cody Sosebee, rodeo’s top entertainer, to Cowtown. Sosebee, the 2018 PRCA Barrel man of the year will entertain the crowd and be giving away merchandise during breaks in the action. Budding bull riders (girls and boys) age 6 and under can enter the Tuff Hedeman Challenge Stick Bull Riding by emailing stickbullrider@aol.com. Winner receives Tuff Hedeman Trophy Buckle. 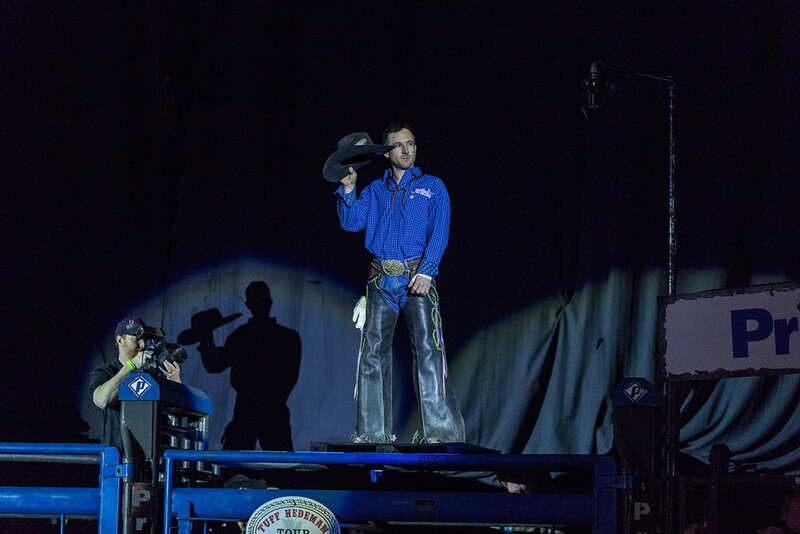 LAS VEGAS – Four-time world champion bull rider Tuff Hedeman heats up Las Vegas with the Tuff Hedeman Bull Riding Tour, presented by Boot Barn and Discount Tire, at the South Point Arena & Equestrian Center on Saturday, March 2 at 7:30 p.m. Featuring Hedeman’s signature style event, 24 of the world’s best bull riders will compete in the invitation only, three-round competition with a sudden death format. Tickets are on-sale now starting at $30 here. The two-hour adrenaline rush show will feature a star-studded lineup of world-class bulls, including bull icon Hellfire, pitted against champions and the hottest bull riders on the tours today. As the fourth stop of the nationwide tour, Tuff Hedeman Bull Riding Tour will have three World Champions and nine Wrangler National Finals Rodeo qualifiers competing, including but not limited to Jeff Askey, Koby Radley, Dustin Boquet, and Eli Vastbinder. “The last time a group of bull riders like this were in Las Vegas was during NFR, and if you missed them in December, you can see several world champions and the NFR guys back in town at the South Point," said Hedeman. 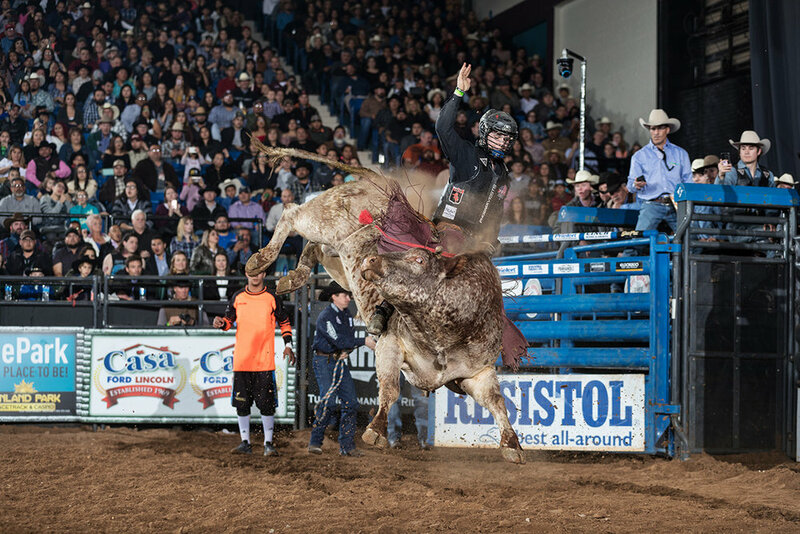 “It is going to be an intense weekend of competition plus some great family fun entertainment, and no bull riding experience or knowledge is necessary to enjoy this high energy adrenaline rush show,” said Hedeman. In addition, top-shelf entertainment by past NFR entertainer of the Year, JJ Harrison, Tuff Hedeman Bullfighters and grand pyrotechnic introductions will add to the adrenaline rush competition. Bullfighters Only champions Bryce Redo (Dayton, TX) and Beau Schueth (Emmitt, NE), both personally selected by Hedeman, will also be back saving lives on the dirt in front of the chutes. Bryce Redo and Beau Scheuth will be back in Las Vegas fighting bulls and saving lives. Doors will open at 6:30 p.m. for ticket holders to enjoy the pre-event activities on the concourse including great food, cold beer, shopping, and autograph opportunities. Leading up to the weekend event, Hedeman will be joined by Hellfire, Eli Vastbinder and Bryce Redo at the Downtown Las Vegas Events Center on Thursday, Feb. 28 during the Ultimate Sports Weekend Fan Fest from 3 to 6 p.m.
Hayden Shaw and Hellfire will be at the Las Vegas Event Center meeting and greeting on Feb. 28 from 3 pm to 6 pm. Tickets are on sale now at Tuff Hedeman Bull Riding Tour Tickets or by visiting the South Point Arena website. Tickets are also available in-person at the South Point Box Office, 9777 Las Vegas Blvd South, Las Vegas, NV 89183 or phone 702-797-8055. Featuring more than 2,100 guestrooms, South Point Hotel, Casino & Spa overlooks the famous Las Vegas Strip and the serenity of the surrounding mountainscape. Each oversized guest room features state-of-the-art LED televisions as well as WiFi with high-speed internet connections. Guests visiting South Point will experience affordable luxury through a casino offering top-of-the-line gaming technology, more than 60 table games and a separate race and sports book area, 11 restaurants, including the award-winning Michael’s Gourmet Room, the world-class Costa Del Sur Spa and Salon, a 400-seat showroom featuring headliner entertainment, a 700-seat Bingo room, a 16-screen Cinemark movie complex, a state-of-the-art 64-lane bowling center, a 52,000-square foot Conference Center and an 80,000-square foot Exhibit Hall. South Point Hotel is also home to the Tournament Bowling Plaza, a multi-million dollar professional bowling tournament facility. In addition, South Point has the finest equestrian event facility in the country. The event space features three climate-controlled arenas, vet clinic, feed store, more than 1,200 climate-controlled stalls and plays host to some of the country’s most unique events. South Point Hotel, Casino & Spa is at 9777 Las Vegas Blvd. South, Las Vegas, NV 89183. 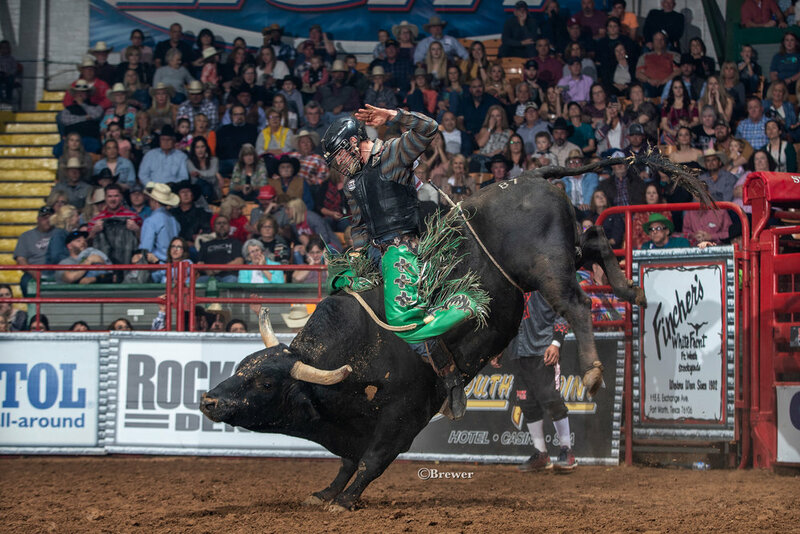 EL PASO, Texas (February 17, 2019) – In a sold-out El Paso Coliseum, 29-year-old Cody Rostockyj looked only left for inspiration and qualified rides as he pitched a perfect night to pack up the prizes, including a $2,000 bonus for wearing Rock N Roll Denim jeans, and the win worth $20,500 from the Casa Ford Tuff Hedeman Bull Riding presented by Sunland Park Racetrack and Casino. 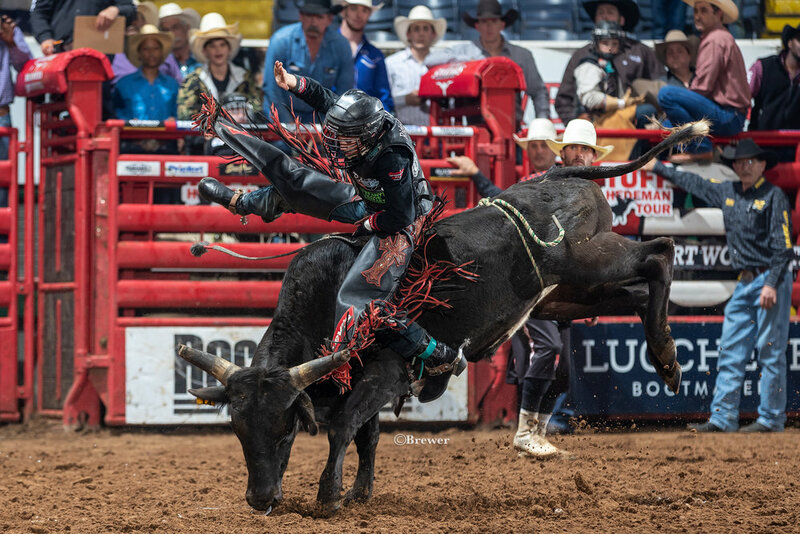 “On my first two rides I was riding and feeling really strong to the left, and with the Casa Ford guys cheering me on so much in that left chute area, I picked my final four bull because he went to the left and I knew they would kind of lift me up,” said Rostockyi. Riding two bulls, he knew well and one unknown, the second eldest bull rider on Tuff Hedeman’s invitation-only roster loaded up and made the trip to El Paso to fight back to the top of Tuff Hedeman’s invitation-only bull riding roll. “Fun to see a guy that has been around and loves the sport be so competitive tonight, he always tries hard, and he had to fight hard to get past two of the industry's hottest riders, “ said Hedeman. With 14 qualified rides on the board, three-time NFR qualifier Roscoe Jarboe and JT Moore both rode two and finished second and third respectively. Both Jarboe and Moore have advanced to the final four shoots out in the last two THBRT events with Moore winning Hobbs and Jarboe winning Bossier. Laramie Craigen was fourth with the highest mark ride of the night, 91.5 points on Mike Rawson’s Speckled Chicken to win round one. “JT (Moore) is riding really impressive, and Jarboe is one of the best going down the road, and Craigen made a great ride tonight, but I tend to root for the old guys because I am one of em,” laughed Hedeman referring to Rostockyj’s age. Rostockyj, joined by the Casa Ford and Sunland Park families, Tuff and Clarice Hedeman celebrate fourteen years of Tuff Hedeman Bull Riding in El Paso. 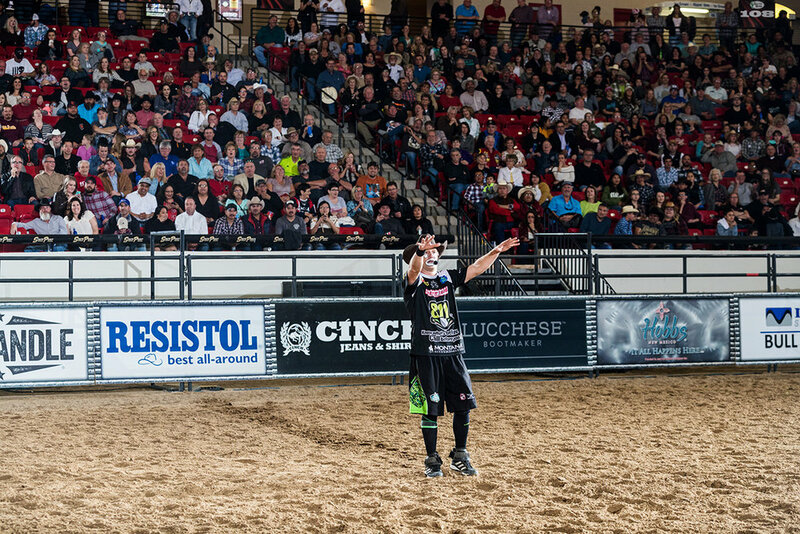 “Our guys always make great efforts in El Paso, the energy in the building produces great rides and big scores, and the fans were really into it tonight – it was once again the cool place to be on Saturday night in El Paso, and I love bringing this event back to El Paso year after year,” said Hedeman. Eight riders heard the whistle while still aboard, but it was Cody Rostockyj, the first man out who drew a familiar foe, Jeff Harris’s Dirty Little Secret. It was a bittersweet draw, he won the TH Breakout tour stop in Jacksonville on him, but also bucked off of him once, and Rostockyj knows you better bring your best to cover one of the favorite draws on tour. 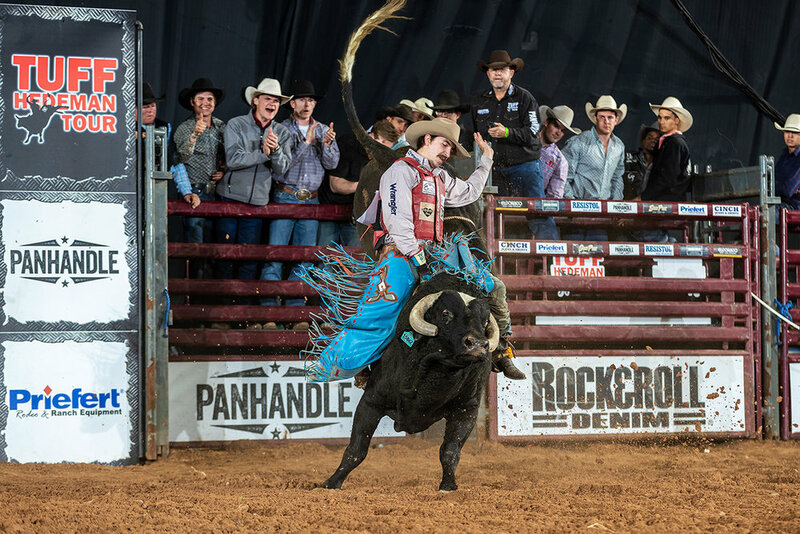 "It was a rematch, but it was kind of funny, the bull was leaning, and I was motioning for them to move and they opened the gate before I was ready, I just had to make the best of it, and I was glad it worked out," said Rostockyj who placed fifth in the round with 88.5 points. Moore spurred his way to an 86 on Barker’s 320 Stix, and Jarboe easily handed in 89 points on 14 Red Cloud (Burruss). THBRT rookie Colton Fritzlan from Rifle, Colorado answered that ride with 89.5 on J11 Chocolate Thunder, but it was Laramie Craigen that brought the fans to their feet with his 91.5 trip that would seal the lead in round one. Additionally qualified rides would be Matt Palmer was 89.5 on 1394 Flip Ya Lid (JQH), Lane Toon 87.5 on 272 Rifleman (Davis) and Tyler Taylor 87.5 on 516 Texas Ranger (Davis). Eight competitors advanced on scores bringing four back to the Semifinal round based on time ridden. One of those would be Brady Portenier, a THBRT rookie who debuted in Bossier City and advanced for the second consecutive event. He would tie the round for 90 points on Rawson’s 453 Tombstone with Jarboe who was 90 points on 20 Cadillac Jack (Danley and Spence). Idaho bull rider Brady Portenier plits the semifinal round win riding on 452 Tombstone for 90 points, Rawson Bucking Bulls. Trey Kimzey who also advanced on a heartbreaking 7.79 first round go, smoothly rode Danny Mason's new bull on the team, -31 Addiction, for 88 points. Rostockyj finished last in the round riding 472 Curly Bill (Burruss). “I actually got on him in Lake Charles two weeks ago, and he bucked me down in 7.9 seconds, it was a grudge and redemption tonight, but then he got caught up in the chutes and came out backwards causing an off trip, he went right and then back left,” said Rostockyj. 3-time NFR qualifier Roscoe Jarboe splits the semifinal round on 20 Cadillac Jack, Danley-Spence Bucking Bulls. With three riding two, Laramie Craigen would advance to his first Shoot Out round with Rostockyj, Jarboe, and Moore. Leading the pack was Roscoe Jarboe with 179 on two. He selected 30 Off the Rez (Burruss). Coming in second on two with 175 points, Cody Rostockyj had the second pick of the Shoot Out and chose a bull Tuff Hedeman said he could win on. Counting on his Casa Ford box seat of enthusiastic fans, Rostockyj would bring them and the entire coliseum to their feet as the lone rider to cover his bull riding 279 Streets of Bakersfield (Burruss Bucking Bulls) for 90 points and the win. “If you didn’t pick up a check on your way out, it’s because you didn’t ride well enough on this night, JT had a chance, Jarboe had a chance if you ride - whatever you have drawn - you are going to win something,” said Hedeman. 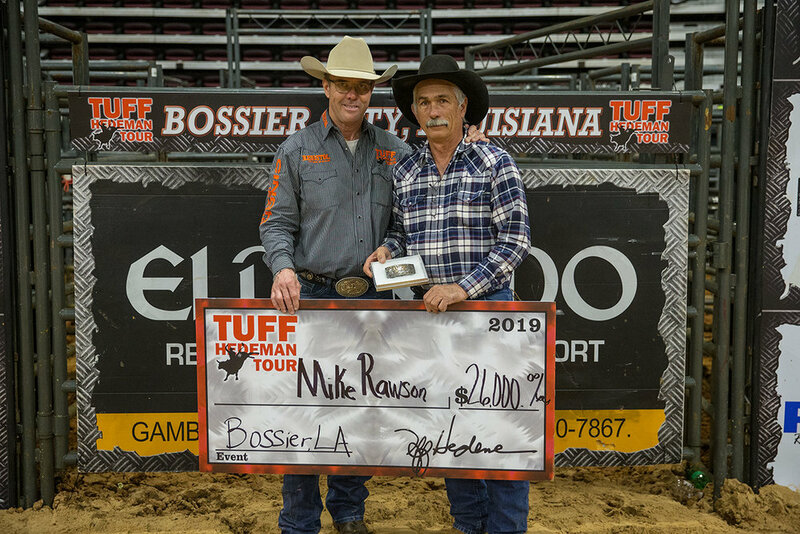 Accepting his sixth THBT Challenge check from Tuff Hedeman, Mike Rawson of Martinsville, Texas is grateful for the opportunity the THBRT gives him to do what he loves. Many ponder the success of his bull teams during the last 12 months, but the secret to Mike Rawson’s success is in his parallel viewpoint to Tuff Hedeman’s event strategy. "In my opinion, a really good bull comes out and does his job -- which is to buck, getting points for the cowboy while entertaining the crowd," said Rawson. Rawson was one of two teams to post a perfect night with three qualified rides and a total score of 286.50. Laramie Craigen tapped off Mike’s favorite child, 2801 Speckled Chicken to win the opening round with 91.5 points and that score would hold as the highest marked ride of the night. “I was worried about 2801’s match with Craigen because of his size, he's a bigger rider, but it turned out good," said Rawson. Good might be an understatement, Craigen and Speckled Chicken were the round winners and the second rankest ride score of the night with a 90 point bull score. Lane Toon assisted Rawson when he covered 272 Rifleman for 87.5 points in round one. 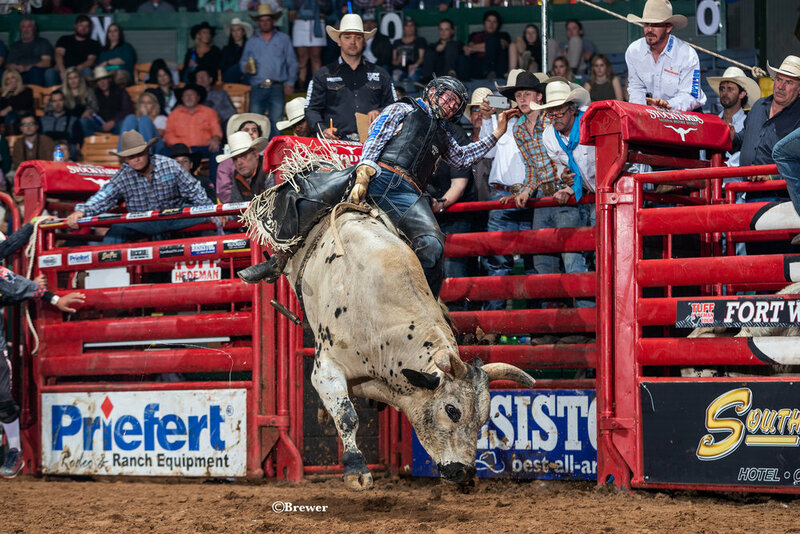 JT Moore was matched with Rawson’s newest addition, 3015 YoYo, a bull that is still learning the ropes and chutes of the tour, but it didn’t slow JT Moore down, and they were a picture perfect 88.5 points. 1, Cody Rostockyj, Lorena, Texas 90 points on 279 Streets of Bakersfield (Burress), $18,250. 2, Roscoe Jarboe, New Plymouth, SD, No Score on 30 Off the Rez (Burruss), $1,000. 3, JT More, Alvin, Texas, NS Fat Boy (Harris), $1,000. 4, Laramie Craigen, Hampshire, Texas, NS on 212 Woody (Burruss), $1,000. 1, Cody Rostockyj, 265 points on 3, $20,500. 2, Roscoe Jarboe, 179 on 3, $2,250. 3, JT Moore, 174.5 on 3, $2250. 4, Laramie Craigen, 91.5 on 3, $1,500. 1, Mike Rawson, Martinsville, TX, 3 qualified rides, 286.50 points, $18,000. 2, Burruss Bucking Bulls, Bradford, AR, 3 qualified rides, 285 pts, $13,500. 3, Harris/Rocking C Bucking Bulls, Palestine, TX, 2 qualified rides, 282 pts, $9,000. 4, JQH Bucking Bulls, Amarillo, Texas, 1 qualified ride, 281.80 pts, $4,500. Watch the Tuff Hedeman Bull Riding Tour on TuffRideTV.com. Follow Tuff and the tour on www.tuffhedemanbullriding.com and on Facebook (Tuff Hedeman) and IG @TuffHedemanOfficial. For more information contact Leigh Ann Schroeder, Tuffhedemanpr@gmail.com, 940.902.1112. BOSSIER CITY -Two National Finals Rodeo qualifiers who call the Bayou State home will be returning to their native state for one night only as they hope to tap the hometown advantage atmosphere while trying to win the Eldorado Resort Casino Shreveport Tuff Hedeman Bull Riding held February 2 at the Century Link Center in Bossier City. “Koby Radley and Dustin Boquet are premier athletes from Louisiana and you won’t want to miss the opportunity to see them ride - if you didn’t make it to the NFR in Vegas where the ticket prices are high, you will see several world champions and at least 9 NFR guys right here in Bossier,” said Hedeman. Louisiana bull rider and NFR qualifier Koby Radley who grew up in Louisiana hopes Bossier will be a hometown advantage in Bossier. Radley finished 2018 10th in the PRCA World Standings..
Bullfighters Only Champions Bryce Redo and Beau Schueth provide cowboy protection as the Tuff Hedeman Bullfighers in Bossier. Stoney LaRue will be Tuff’s special guest and he will be in concert on the arena floor immediately following the bull riding. LaRue has sold over one million records over his career and plays 200-plus shows a year and is known and loved for his real life, thinking man’s music. With 30 years of bull riding history on his resume, Hedeman is one of the most recognizable cowboys in the history of rodeo and bull riding, but he defers to the young superstars like Radley and Boquet as the best bull riding talent he has seen in recent years. You and your family will enjoy top-shelf entertainment including the Tuff Hedeman Bullfighters, grand pyrotechnics introductions, and great family fun entertainment from leading entertainers in a jammed packed two-hour adrenaline rush show. Doors will open at 6:00 p.m. for ticket holders to enjoy the pre-event activities on the concourse including great food, cold beer, shopping and autograph opportunities. Tickets are available at the CenturyLink Center Box Office located at ground level across from parking lot A on the Northwest side of the arena. The Box Office is open Monday – Friday from 9:30 am – 4:30 pm. Patrons may purchase tickets in person during these times or 24-7 online at Ticketmaster.com. For more information, interviews and media credentials, please contact Leigh Ann Schroeder, 940.902.1112 or tuffhedemanpr@gmail.com. JT Moore earns 89 points on Hou Did He Buck (Dennis Davis/Gem) in the final four Shoot Out Round of the Hobbs Tuff Hedeman Bull Riding. 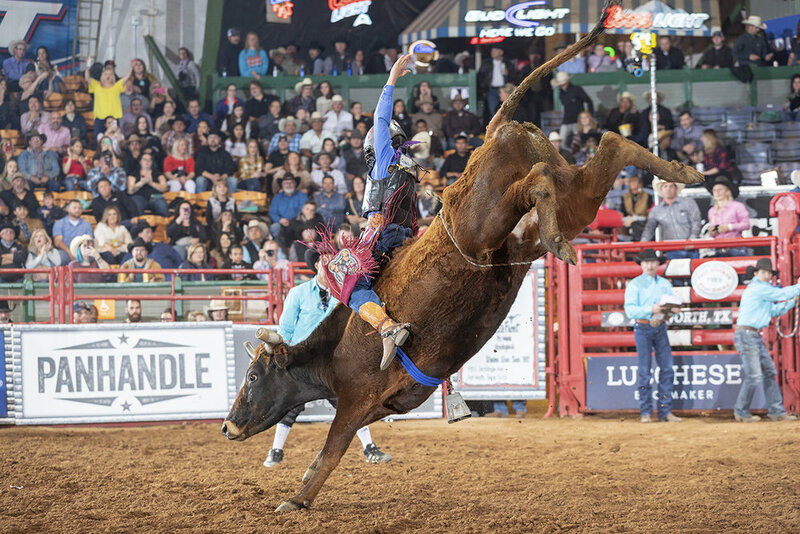 HOBBS, New Mexico – Two familiar sparring partners faced off on the arena floor when 23-year-old JT Moore made a big move in front of a packed house to stay on top of Hou Did He Buck for 89 points in the Shoot Out round to win the annual Hobbs Tuff Hedeman Bull Riding (THBRT). "I am extremely blessed and got on some great bulls here tonight, I would not want to be anywhere else than here, thank you Tuff, and I want to thank Jesus Christ, my savior for allowing me to do this, all the glory to God first," said an emotional Moore as he accepted his first THBRT event win check and custom trophy buckle from Hedeman. Fans were watching the Tuff Hedeman Bull Riding Tour streaming live for the first time on TuffRideTV.com, witnessed Moore execute a perfect 3 for 3 night outlasting thirty of the industry's top competitors collecting $26,625, the largest win check of his young career. Moore added he plans to let the winnings bankroll his dream of becoming a World Champion bull rider. 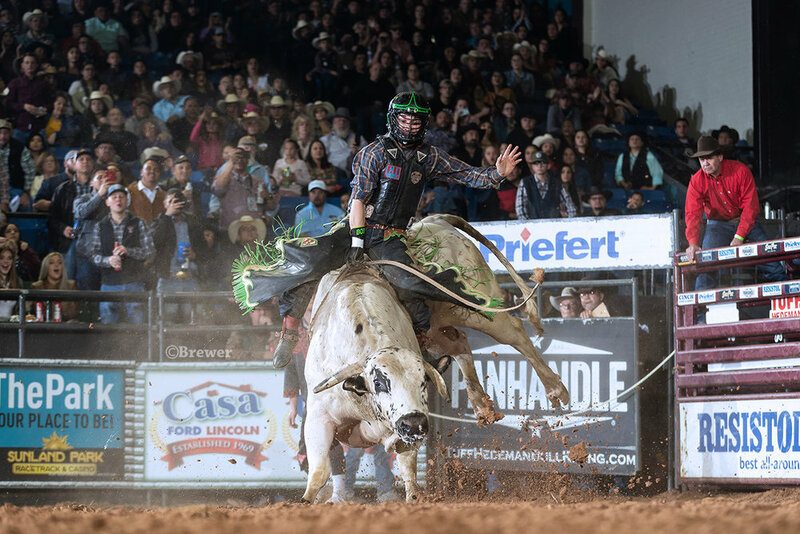 Moore, one of three riders to hear the whistle on all three bulls, thrilled the rowdy crowd at the Lea County Events center edging out veteran rider Jeff Askey when they both posted 89 points in the final round. THBRT rules defer to the back judge in the event of a tie, and Moore received the higher score and was declared the 2019 Hobbs Tuff Hedeman Bull Riding Champion. Moore, a former CPRA and UPRA champion, began his career riding sheep and progressed to the pro events thru the ranks of junior and youth rodeo. He is a three-time Region 7 Texas High School bull riding champion, and in addition to the THBRT, he is currently riding in the Professional Rodeo Cowboys Association. On a night where the bull riders were in control and in hot pursuit of the biggest payout on the THBRT, the fans enjoyed 22 qualified rides from forty-eight outs. Hedeman’s two-hour adrenaline rush bull riding has entertained west Texas fans for nine years with the sidesplitting humor of barrel man JJ Harrison, Stick Bull Riding Championships, t-shirt throws, and this year an emotional moment of recognition for Patriot U.S. Marine Veteran Justin Rokohl, who lost both legs in service to our country. The Hobbs THBRT produced by 4-time World Champion bull rider and pro rodeo hall of Famer Tuff Hedeman featured a field of 30 elite bull riders including World Champions and 12 PRCA NFR qualifiers. "The fans here are awesome, and they love watching bull riding…you can't beat the atmosphere, they are knowledgeable about the sport, from the introductions to the last rider they are as loud as you can ask for and it's always fun to come here," said Hedeman who transitioned from riding to producing when he retired from riding in 1998. “For me transition from retiring as a cowboy athlete was easy because I went from competing to producing and I love both, I put the same amount of effort and energy into producing events as I did while I was competing. I love coming back to Hobbs, I grew up coming here and have a lot of friends here, it was a great night night,” said Hedeman. The bull riders came ready to ride and posted 13 qualified rides in the opening round. The first gunner Juan Alonzo opened up the round and the event with an 87.5 ride on Nightmare (Richardson Land & Cattle). Alonzo would retain the lead past Trey Benton (85 pts), Tyler Tayler (82), Brody Yeary (86) and Riker Carter (85). But in section two, JT Moore drew 2801 Speckled Chicken (Rawson) and was 88 points to win the round in spite of noble efforts from Boquet (87), Tyler Bingham (87), Koby Radley (86), Jeff Askey (84), Parker McCowan (83) Matt Palmer (83), and Lane Nobles (81). "My first bull I had gotten on before, and he bucked me down in San Angelo, and tonight he was right around to the right, but he started to push back a little, and I had to bow my chest out, but at about 6 seconds I started spurring, and it worked out," said Moore about Mike Rawson's Speckled Chicken. Seven qualified rides highlighted the 12- man semifinal round with six riders now with two scores. Parker McCown stole the show with the first and only 90 point ride of the night. Bringing the crowd to their feet, McCown scored the highest marked ride of the night aboard Owen Washburn's 191 Big Jake, an NFR and CBR World Finals bull who is rarely ridden and McCown was now in the lead with 174 on two bulls. Jeff Askey was not sure he was going to get out of round two as he describes his bizarre twist of fate when he was fouled twice and got on three before posting his 85.5 scores to clock in at 170.5 on two. "I knew my second bull Divinity from watching a buddy win the round on him at the NFR, I was excited to have him, but he got kind of caught up in the ground and went down, so I got a re-ride. The next bull was a black bull that wore us both out in the box, and then he hipped himself causing a second foul resulting in a re-ride. Then I saw a familiar face loaded as the re-ride bull Savage Moves which I had won a rodeo on him before, and he was right around to the left and jumped out of his pattern a little, but I got the score (85.5) to move on." Watching and waiting thru the Askey drama, gave Moore more time to think about riding Gin Smoke Lies (Winston/Melton) and he posted an 88 for the final ride of the round and was now in the lead with 176 on two earning the first bull pick of the Shoot Out round. "My second bull was one of Cory's (Melton), and he was a great bull to get on, just right there around to the left kicking and spinning the whole time," continued Moore as he signed autographs. Askey, one of two bull riders to ride three rode Melton’s Chaos Ghost for 89 points in the Shoot Out round. Askey lost the title to Moore on a back judge tie-breaker score. Askey placed second and took home $15,000 for his efforts. The four-man was set with the top four average scores coming back to duke it out for the check, which the amount is determined by the number of scored rides in the three rounds. Six bull riders posted scores on two which resulted in Lane Nobles and Matt Palmer being edged out by Tyler Taylor, Parker McCown, Jeff Askey, and the event leader JT Moore determined by aggregate scores at this point in the competition. Tyler Taylor bucked off first. Askey, now boarding his fifth bull of the night let Cody Rostockyj pick his bull. Wearing his color of cash green chaps, Askey was right on the money with Rostockyj’s pick and seemed to be glued to Chaos Ghost (Melton) for 89 points and the first man to go three for three. 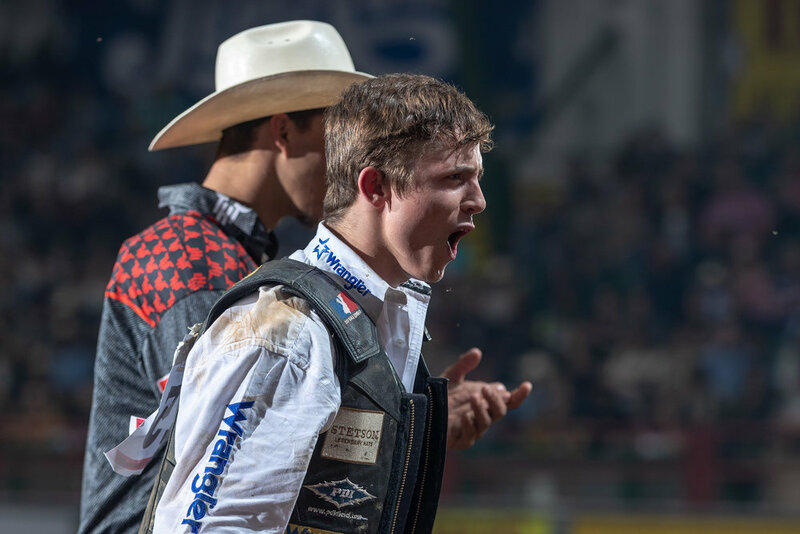 “I have won several events and have never picked my own bulls - Cody said he would fit me and would be right around to the right and he was,” continued Askey. Parker bucked off, and that left JT Moore who was confident and excited to put his rope on Hou Did He Buck, a familiar opponent. "This was an easy pick for me, it was my South Texas buddy Dennis Davis's bull and I had been on him and ridden him twice, he was right there around to the left. I rode him two years ago, and I felt really confident," continued Moore. "You know when you come to Tuff's events that you are going to get on really good consistent bulls and then it's up to us with what we do with that." Tuff Hedeman presents $30,000 win check to Mike Rawson for the Bull Team competition in Hobbs. Rawson’s trio of buckers won the title on three qualified rides. Mike Rawson collected the $30,000 check and custom trophy buckle from the 15 team TH Bull Team competition. His trio of buckers posted three qualified rides to put him in the winner's circle. Riker Carter was 86 points on 220 High Voltage, and JT Moore won the first round with 88 points on NFR and CBR Finals bull 2801 Speckled Chicken. Demond Haynes took 490 Westbound for an 87 point spin in the Semifinal round clinching the win for Rawson. “Tuff got the best lineup of bull riders you could ask for for this event and I was blessed tonight to draw three good riders who all gave great effort, Speckled Chicken led the team with a grudge match, but JT won, and he was 88 with a good trip," said Rawson of Martinsville, Texas. 2.55 points behind Rawson was JC Knapp with 276.45 total points from two road warrior bulls, Uptown Funk and Kookaburra and a new bull named Simple. 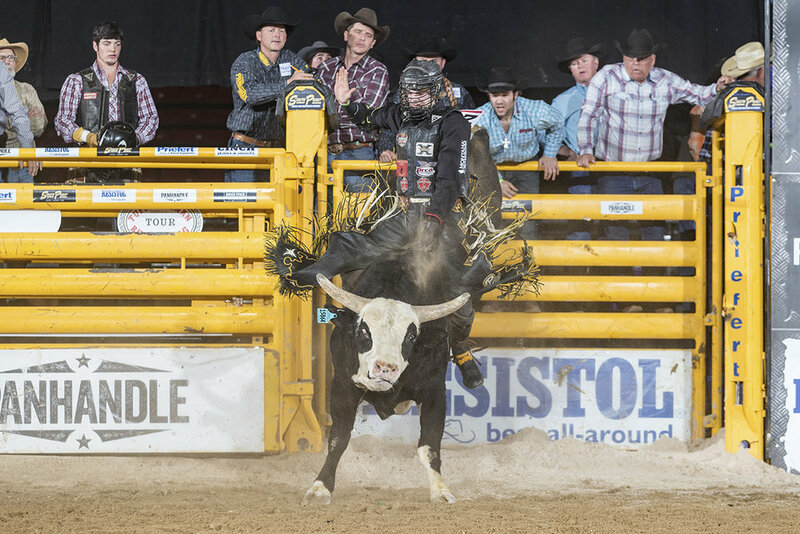 In contrast to Rawson, Knapp earned his check in Hobbs from rank bull scores with Kookabura leading the night of rank scores in an all-out 6-second effort by Trey Benton in the semifinal round. Billy Jones who returned to THBRT with partners Carr Pro Rodeo and Ferguson earned his check with 3 bucks offs and solid bull scores that totaled 276.08 points. In fourth place was Winston and Melton Bull Company with two qualified rides from Tyler Taylor and JT Moore and a 7.39 time by Cody Rostockyj on 435 Time to Shine. 1., JT Moore, Alvin, Texas, $26,625. 2, Jeff Aksey, Athens, Texas, 89 pts on 15,375. 3, Parker McCown, $2,250.4,Tyler Taylor, Stephenville, Tex., $2,250. 1., JT Moore, 265 pts on 3. 2, Jeff Askey, 259.5. 3, Parker McCown 174. 4, Tyler Taylor 170.5. 5, Matt Palmer 169.5 on 2. 1, Mike Rawson Bucking bulls, 279 points, $30,000. 2, JC Knapp Bucking Bulls, 276.45 pts, $22,500. 3, Carr/Jones/Ferguson, 276.08, $15,000. 4, Winston/Melton/Bull Co. 275.87, $7500. Two-time NFR qualifier and 2017 PRCA Rookie of the Year Boudreaux Campbell Returns to Hobbs to attempt a third Hobbs Championship title. Campbell is from Crockett, Texas. 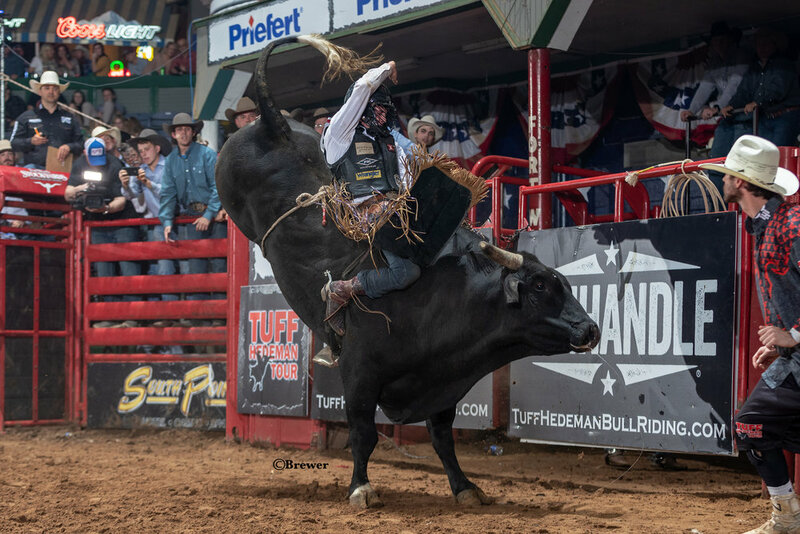 HOBBS - Bringing professional bull riders and money together for years, Tuff Hedeman hits town this weekend with the season opener for the 2019 Tuff Hedeman Bull Riding Tour. The four- time World Champion and Pro Rodeo Hall of Famer has 24 bull riders lined up to take a shot at this year’s prize purse worth a total of $54,000. “It pays to come to Hobbs,“ said Hedeman who owns and produces the annual bull riding this weekend at the Lea County Events Center. Hedeman who is considered the pioneer of the sport of bull riding continues to develop ways for bull riders and stock contractors to make a living on and off the rodeo trail. When the final check is written Saturday night, Hedeman will have paid out $154,000 between the 2018 and 2019 bull riding making Hobbs the largest purse on Tuff’s bull riding tour. Kids 6 and under can enter the Stick Bull Riding - Email Stickbullrider@aol.com to enter. Bull riders know - money and momentum are the two most important factors in building a successful season. “This weekend’s purse will help several cowboys fund their rodeo season giving them money to travel and pay entry fees to their next event while pursuing their dreams,” said Hedeman. 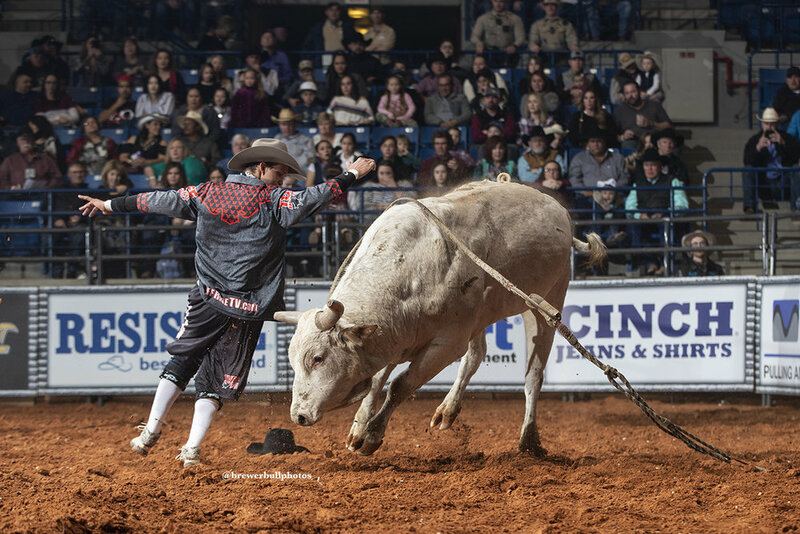 Hedeman brings the family friendly event to Hobbs with fun for the entire family. 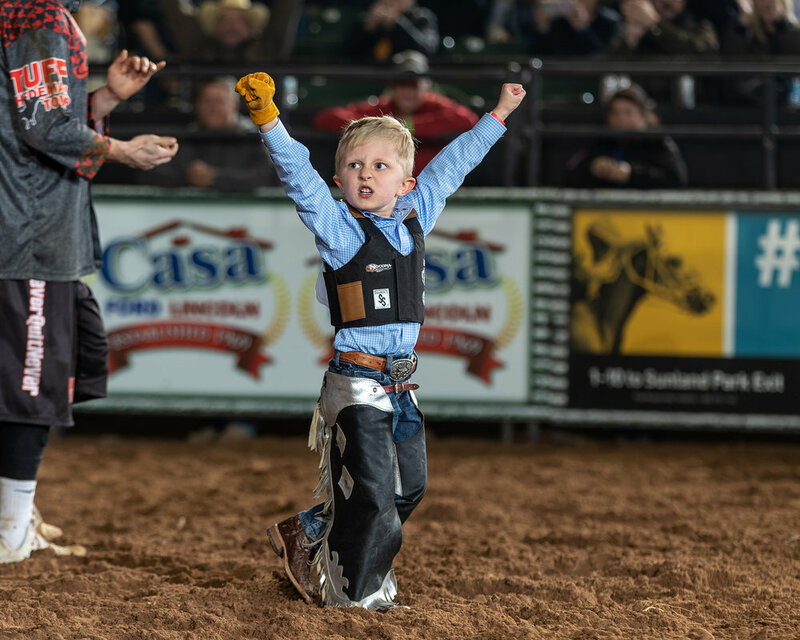 Kids 6 and under can get in on the action and win custom trophy buckles and prizes at the stick bull riding which begins before the show. Email stickbullriding@aol.com to enter and its free! “New Mexico is a big part of my personal history and the people here supported me during my career and I enjoy keeping the bull riding tradition going and bringing a family friendly event to the people of New Mexico,” continued Hedeman who honed his craft as a youth attending junior rodeos in New Mexico. According to Hedeman if you did not make it to Las Vegas for the NFR, you can see the same guys in Hobbs for a lot cheaper. Tickets are several hundred dollars a seat at the National Finals Rodeo and start at only $25 in Hobbs. Three World Champions including the reigning PRCA champ Sage Kimzey, four-time PRCA World Champion JW Harris and CBR World Champion Josh Barentine will be challenged by at least 21 additional riders 13 of whom have qualified for the National Finals Rodeo. Of that list only two bull riders in five years have come close to beating 5-time World Champion Sage Steele Kimzey (Strong City, OK) for year- end titles and gold buckles and both will be in Hobbs trying to get an early jump on the champ. 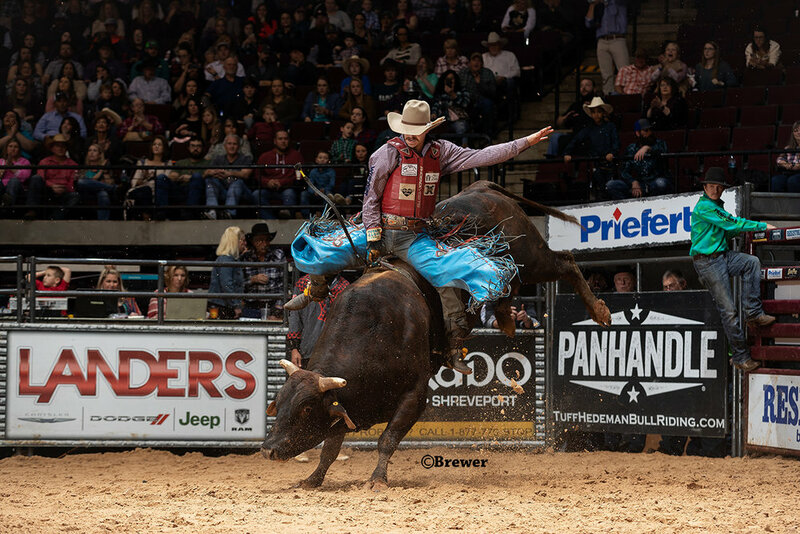 Trey Benton III (Rock Island, TX) came close in 2017 at the National Finals Rodeo (NFR) and Eli Vastbinder (Athens, TX) in 2017 lost the CBR World title to Kimzey by a mere six points. Eli is rested and ready after winning two rounds and over $78,000 at last month’s NFR and Benton has made it a personal goal to win a year end gold buckle before retirement. Kimzey who continues to break records is one step closer on his quest to beat Don Gay’s bull riding record of eight PRCA World Championships as he racked up No. 5 in Vegas. Back in Hobbs from his broadcasting debut at the NFR is four time World Champion bull rider JW Harris (May, Texas). You might have heard JW commentate from the back of chutes on CBS Sports last month and now you can see him put his money where his mouth was as he lands in Hobbs for a shot at the big pot of gold. Two Time HOBBS champion Boudreaux Campbell returns to Hobbs where he thinks the arena is “magic” to try and win a 3rd Hobbs championship. This 2017 PRCA Rookie of the Year and 2-time NFR competitor is on the bull riding world’s young gun list. The two hour adrenaline rush event features a star studded line up of world class bulls pitted against the proven champs and the hottest bull riders on the tours today. Past Bullfighters Only champions Bryce Redo (Dayton, TX) and Beau Schueth (Emmitt, NE) will be saving lives on the dirt in front of the chutes. Both are personally selected by Hedeman to assure the rider’s safety in Hobbs as they dismount and get clear of the bull and the arena. They work all 50 “outs” and remain in the arena for the entire duration of the show protecting all personnel on the dirt. Local Lubbock businessman and stock contractor (aka bull man) Tom Baker and 14 other teams of bulls will compete in the Bull Team Competition that features three bulls per team entries, total prize purse $75,000. Hedeman, who has produced the Hobbs event for 9 years, recruits rodeo’s leading entertainment including returning NFR barrel entertainer JJ Harrison who will join Hedeman and the riders at the Meet and Greet on Friday, January 18th from 5:30-7:30 PM at the Pacific Rim Restaurant, from 5 – 7 pm, 1309 Joe Harvey Blvd, Hobbs, NM 88240. Doors will open at 6:00 p.m. and the competition will get underway at 7:30 p.m.
TICKETS: Hobbs Ticketing Link (selectaseatlubbock.com) or Lea County Events Center Box Office (575) 391-2900. 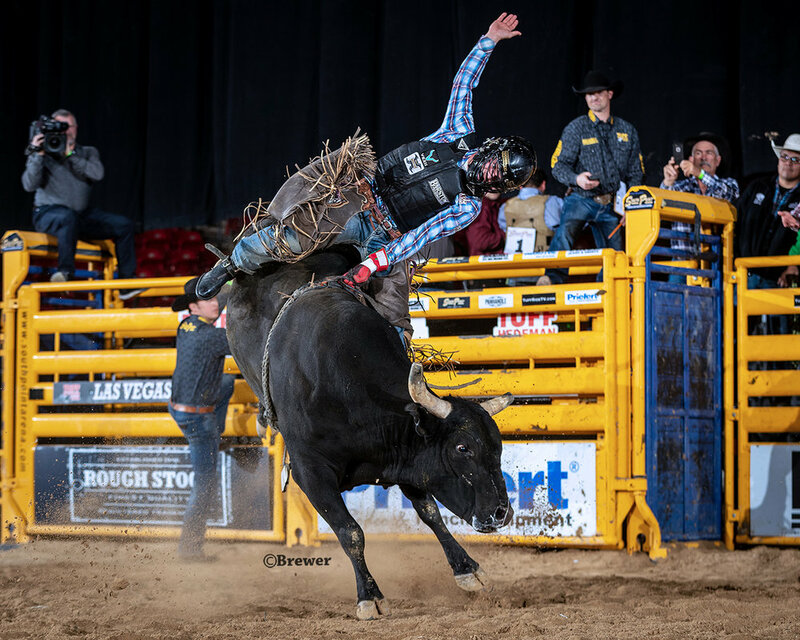 5-Time World Champion Bull Rider Sage Kimzey Returns to Hobbs after missing 2018 due to injury. Momentum and money generate the superstar roster of bull riders scheduled to compete at the 2019 Hobbs Tuff Hedeman Bull Riding on January 19. The annual event at the Lea County Events Center kicks off Hedeman's 2019 nationwide bull riding tour with a one night only three-round tournament style performance worth $54,000 in prize money to the invitation-only bull riders. “Anytime you have over $50,000 available to riders, you will draw the elite athletes of the sport, Sage Kimzey continues to break bull riding records and the talent level this year exceeds expectations with the NFR’s hottest guys riding in Hobbs, said Tuff Hedeman, 4-time World Champion, Pro Rodeo Hall of Famer, and pioneer of the sport of bull riding. The invitational roster is headlined by 5-time and reigning PRCA World Champion Sage Kimzey, but he will have his hands full as the challenges include many of the same riders he fought past less than 30 days ago at the recent National Finals Rodeo in Las Vegas. Scheduled to compete are 4-time PRCA World Champion JW Harris, CBR World Champion Josh Barentine, NFR superstars Eli Vastbinder, Jeff Askey, Trey Benton, Dustin Bouquet, Boudreaux Campbell, and Cole Melancon. “If you didn’t make it out to Vegas, it’s okay most of them will be riding in Hobbs next week, and it is ridiculous how easy they make rank bulls look,” said Hedeman who defers to the younger generation as the real stars. Ticket holders can look forward to the family-friendly event featuring an adrenaline rush two-hour event wrapped around a field of 24 elite bull riders competing in a three-round tournament-style bull riding contest. 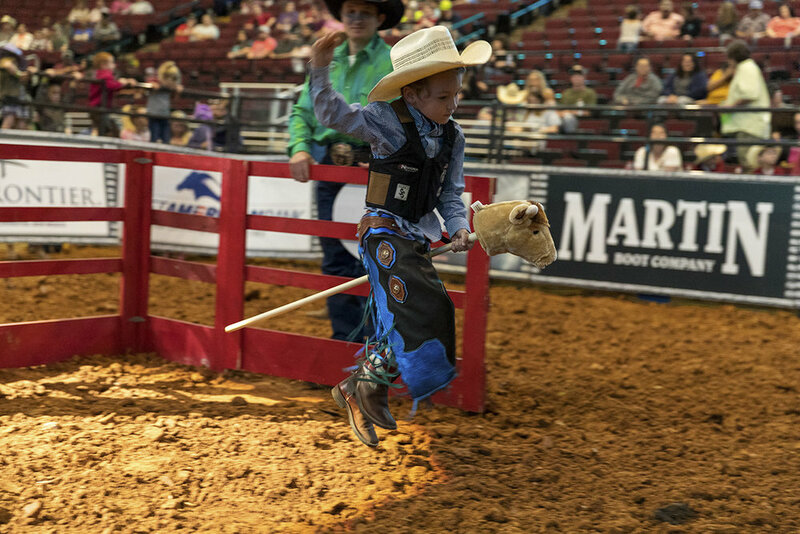 Budding bull riders, boys and girls, aged six or younger are invited to enter the Stick Bull Riding held before the performance for a chance to win prizes and a Tuff Hedeman Championship Stick Bull Riding Buckle. Hedeman encourages interested kids and parents to email soon as space is limited. For more information and to enter email entries to stickbullrider@aol.com. Boys and girls age 6 or under are invited to compete in the Tuff Hedeman Stick Bull Riding with a chance to win a trophy buckle. Email stickbullriding@aol.com to enter. Hedeman, who has produced the Hobbs event for 9 years, recruits rodeo’s leading entertainment including returning NFR barrel entertainer JJ Harrison and the Tuff Hedeman Bullfighters who will join Hedeman at the Meet and Greet on Friday, January 18th from 5:30-7:30 PM at the Pacific Rim Restaurant from 5 – 7 pm located at 1309 Joe Harvey Blvd, Hobbs, NM 88240. Infamous rodeo entertainer JJ Harrison returns to Hobbs to keep the crowd entertained during the bull riding. Doors at Lea County Events Center will open at 6:30 p.m. and the competition will get underway at 7:30 p.m.
For interviews, press credentials and more information, please contact Leigh Ann Schroeder 940.902.1112. tuffhedemanpr@gmail.com www.tuffhedemanbullriding.com. No. 2 ranked PRCA bull rider Parker Breding at the South Point Tuff Hedeman Bull Riding Tour event in March. All eyes will be on second generation PRCA bull rider Parker Breding as he qualified for the NFR in 2018 for the third time with a career high No. 2 position. The Edgar, Montana athlete will lead the pack of bull riders attempting to knock off four-time World Champion Sage Kimzey from the throne he has occupied since 2014. After missing the 2016 and 2017 NFR, 26 year old Breding found his inspiration and with $185,475.93 in 2018 earnings he heads to Las Vegas to make a legitimate run for his first bull riding gold buckle. He started 2018 with $449,946.00 in his PRCA bank of career earnings. He won the National Circuit Finals bull riding title for a third time (2014, 2016, 2018), now sharing the record with ProRodeo Hall of Famer Cody Custer who won three straight (1990-92). He also left Rodeo Houston with almost $60,000 and the infamous rodeo bull riding championship complete with trinkets, prizes and airline vouchers. Breding’s rise as a top contender in the bull riding world is no surprise as he has great advice and coaching from 5-time NFR qualifier Scott Breding, or Dad to Parker. When his oldest son was struggling, “I would have a few bad bull rides and let it snowball into a bad situation,” Parker admitted, Scott would try to offer some advice. “He told me not to worry so much,” Parker Breding continued. “He helped me learn how to shake things off easier. I’ve had some hardships … injuries, financial things … it made me grow up and see things differently. Breding joined the PRCA in 2011 and earned $3,534 in the first year on his permit. In 2012 he won the Pendleton Round-Up and several other rodeo titles, but finished just outside the top 15 at No.25 with $39,338 in money earned. Breding’s 2013 season set his life on a new path as he made a solid NFR Rookie appearance placing in three rounds at his NFR debut. He finished sixth in the average with 312.5,and tenth in the world standings with $114,189. In 2014 he missed the NFR but won the Ram National Circuit Finals and several rodeo titles. A fractured right arm at the Clovis rodeo curtailed his season and he finished 27th in the World Standings with $45,694. In 2015 he finished seventh in the PRCA with $176,247 after winning round 1 and placing in two rounds at the NFR after a bull hooked him under his protective vest and he suffered three fractured ribs on his right side. He continued to compete at the NFR but could not gain any traction in the standings. In 2016 Breding won the RAM National Circuit Finals Rodeo and finished 33rd in the world standings with $41,160. 2017 saw Breding win several rodeo titles but would finish the year outside the NFR as No. 46 with $33,527 in PRCA earnings. Breding began his career as many of his competitors as a high school champion. Breding won the Montana high school bull riding title twice representing the state at National High School Finals Rodeo placing 10th his senior year. He played guard on his Juliet high school basketball team. He looks up to his Dad and Jim Sharp in the bull riding world and when he’s not rodeing you can find him team roping and hunting, following Dallas Cowboys football and San Antonio Spurs baskeball team. 28-year-old Dustin Boquet jumped 47 places from the 2017 PRCA World Standings to qualify for the 2018 National Finals Rodeo as the No. 3 ranked bull rider in the PRCA. He joins the nation’s top cowboys as they head to Las Vegas next week for the ten round Super Bowl of Rodeo. Boquet competed in approximately 110 rodeos that earned him $114,587.51 during his quest to compete at the Thomas and Mack for the first time. "If Prayer becomes a habit then success becomes a lifestyle" is the phrase on Facebook describing the twenty-two-year-old bull rider who also uses #mygamehisglory. The Louisiana native from the Deep South city of Montagut is currently sharing the spotlight with Koby Radley as one of the two latest bull riding sensations to come out of the Bayou state. Finishing third in the PRCA standings headed into the 2018 NFR is no easy feat as this Cajun Cowboy’s home is 45 minutes south of New Orleans. “It is a long drive just to get out of Louisiana - much less to a rodeo or bull riding,” said Boquet now living in Bourg. Boquet financed his NFR run from a good showing early in the year at the San Antonio Stock Show and Rodeo where he won over $41,000 in PRCA dollars. It was that moment he realized he now had more money at his disposal than ever before. He started the 2018 season with $32,272. He has added $114,588 to that already and plans to make more in Las Vegas. He will start the NFR in third place. At 28 years old, it is not his first thought or attempt at bull riding stardom. In 2016, Boguet was attempting a PRCA and CBR run, and in January he broke his leg in the practice pen eliminating him from competition for seven months. When he got back on his feet, he qualified for the 2017 CBR World Finals in Cheyenne where he finished in top 25 and shifted his efforts to rodeo where he earned $32,272 in the early days of 2018 qualifying. 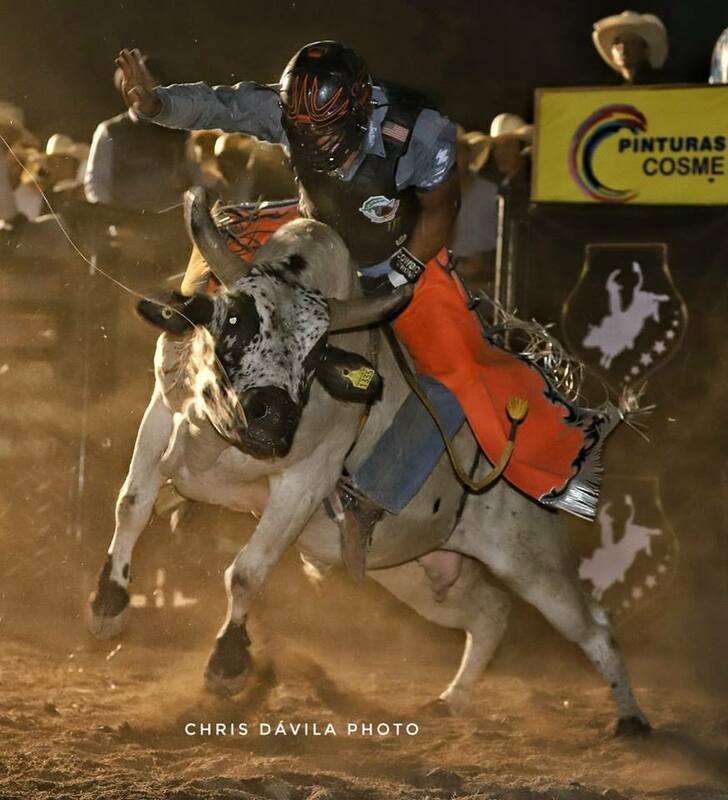 Dustin enjoys outdoor sports including fishing and hunting and joins a long line of successful Louisiana bull riding talent including PRCA World Champion Mike White (1999), PBR World Champions Troy Dunn (1998) Chris Shivers (2003), and CBR World Champion Cole Echols (2013). • Won Dixie National Rodeo in Jackson, Miss. • Won Division 2 Xtreme Bulls in Lawton, Okla.
• Co-champion at the Mid Winter Fair & Rodeo in Lafayette, La.